I’m excited to be on the blog today, talking a little about myself. 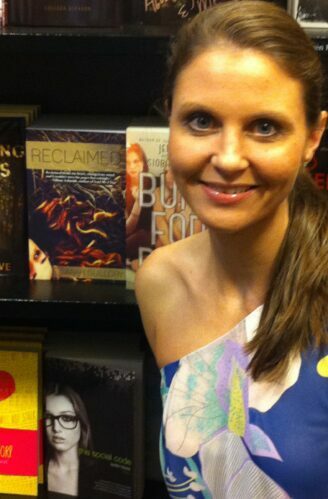 My name is Sarah Guillory, and I wrote Reclaimed, a book about small towns and secrets. I’m a runner. I run six days a week, and I’ve run nine marathons (I do a marathon every other year, as it’s a pretty big time commitment and I need lower-mileage years for both my brain and my body to just love running, without any goals to chase down). And I love running. Like writing, some people say they enjoy having written or having run rather than the actually process, but when I’m running, I enjoy the movement, slipping undetected through that pre-dawn stillness, racing my past self, letting my mind and body wander. Jenna, my main character in Reclaimed, also loves running, but she wasn’t always a runner, and she isn’t a runner because I am. It took me a while to discover that Jenna loves running (at least two false starts and one early draft), and she loves it because it’s her way to escape, the forward momentum that she hopes will take her out of her small town and away from her alcoholic mother. I run less as an escape and more as an act of living in the present, of loving where I live (I’m from a small town and live in a small town and just in general really love small towns), and, as I age, even as an act of defiance. I’m a dog lover. Ridiculously so. I currently have two dogs, a bloodhound who is a year and a half and a six-month-old lab mix my husband rescued from the woods when he was a sick and starving weeks-old puppy. I wasn’t always a dog lover. I’ve enjoyed dogs in the past, but it wasn’t until my first bloodhound that I fell in love, and now I’m kind of stupid about it. But they make me happy (most days, though the lab mix is loving getting up at 2:30 AM right now) and keep me sane and humble and are quite nice writing companions. It’s weird that Reclaimed didn’t have a dog in it, but my last two manuscripts do. And the dog will always live. I’m a teacher. And I love it. There are very few professions where you can talk books all day, and I’m lucky enough to find one. I’m even luckier that I get paid to try and make readers out of other people. And that’s sort of my mission. I hope that each year every single one of my students encounters a book that turns them onto reading. If it’s not one I’ve assigned, I hope it’s one I’ve recommended or mentioned or have on my shelf in the back of my room. I believe that reading makes us better people, provides a better-quality life, shows us who we are as well as places we’ve never seen and people we will never be. It challenges us and reveals us, entertains us and sustains us, and I became a teacher because I wanted to pass my passion for books onto others. I’m not always successful, but I am always unabashedly enthusiastic. And if the words I write can do for other readers what stories have done in my life, then all the better. Thanks for reading! You can always find me online at www.sarahguillory.com or on Twitter and Instagram @sguillory262. Random Things or “Love”ing-ly Ever After? I never know when I’m going to fall in love. Especially when it comes to falling in love with new experiences, hobbies, or things. It always starts off innocently enough—there’s a little bit of curiosity, an itch to try something new. Most of the time, that’s where it stays—maybe I’ll take a class or check out a book from the library on “hobby du jour.” But when I fall for something, I fall hard, and I go from curious to “welcome to a new hobby/sport/language obsession” in a heartbeat. Like romantic love, it’s random, unexpected, wonderful, and brings out the best parts of me. I love being a Mechanical Engineer. I love how I was trained to be a problem solver, whether I’m developing medical devices or plotting out manuscripts. I get to use art, physics, and math to make really cool things to improve people’s health and quality of life, and it’s an epic feeling seeing something I made in action, whether in a surgery, recovery, or a post-op x-ray. I love languages. 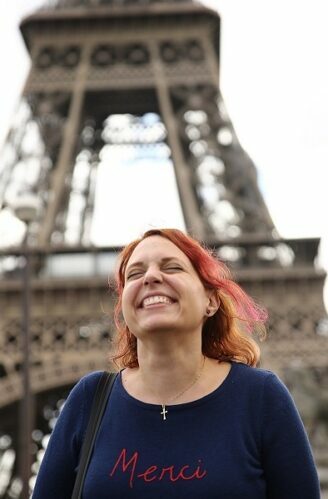 I’m multilingual—bilingual in English and Portuguese and conversational in French and Spanish. I love how language is culture and history all wrapped in the evolution of words and phrases. Writers are word alchemists—we turn words into bookish gold, and it’s fun to have a playground full of possibilities pouring out of multiple dictionaries. I love to dance. Ballet and contemporary were an important part of my life until I ruptured my Achilles tendon. I started figure skating as a sort of physical therapy and fell in love with it, too. Skating went from therapy to a new way to spin, dance, and fly (and I get to pick my skating outfits, which beats recital dress roulette by a mile). Phoebe’s love of archery in Bookishly Ever After was based on teen me’s dream of becoming Susan Pevenzie from the Narnia books. When I started researching archery for Bookishly, I ended up falling in love with the sport and have now been taking lessons in Olympic recurve archery since 2014. I love digging my feet into the grass of the outdoor archery range and I love the feeling when I clump my arrows together so closely, I can hear one arrow skim the others on its way into the target. I love to draw. When I was in high school, I had thought of becoming an English or Art teacher, but when I decided to study engineering, I had falsely believed I had given up all chances of ever doing anything with art or writing. I was certainly wrong with the writing, but I think drawing will remain something just for me and just for fun, like skating and dance and archery. I loved fencing, and fenced foil and epee on my college’s men’s team (we didn’t have enough women to form our own team). It made me feel strong and graceful, and I still feel a little thrill when I see my old gear. And, lucky 7, I love to write, but you’ve probably figured that out already. What about you? What are the things that sneakily found their ways into your heart? What are the random things you love?